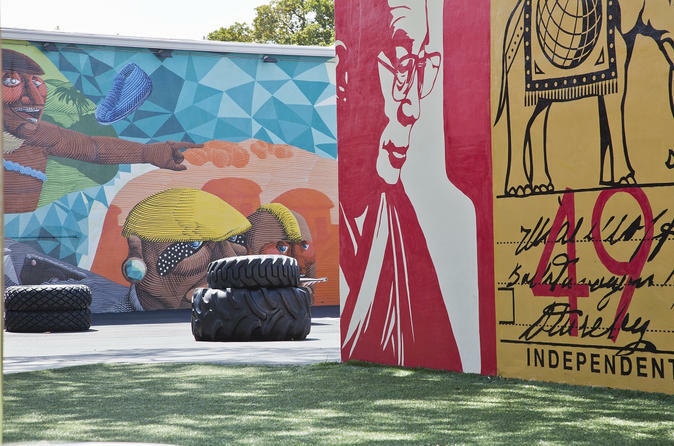 Get a behind-the-scenes look at Miami’s thriving art districts! With an expert art district curator as your guide, explore Miami Midtown, the Miami Design District and the Wynwood Art District and visit several signature galleries and museums to admire and learn about an array of modern and contemporary art, from photography to sculpture to giant murals to conceptual art installations. You’ll then be treated to a gourmet lunch or dinner at a celebrity chef restaurant! Your tour begins and ends at the gourmet restaurant at which you'll enjoy a delicious lunch or dinner. Choose from GKBistronomie (Wynwood), Shokudo (Design District), or Midtown Oyster Bar (Midtown Miami, dinner option only). Be sure to advise your restaurant of choice at checkout. Meet at the restaurant first to embark with your guide, an expert curator in the arts, on a tour of Miami’s three prominent art districts: Midtown Miami, the Miami Design District and Wynwood (specifically the Wynwood Art District). These are all thriving hubs for rising artists, and house a variety of art galleries, museums and special exhibitions and installations. The Margulies Collection at the Warehouse is located in Wynwood. Housed in a large, newly converted warehouse, this collection features contemporary and vintage photography, video, sculpture and art installations. Also in Wynwood is the Rubell Family Collection, one of the world’s largest privately owned contemporary art collections. Featuring well-known and internationally established artists, the RFC actively showcases emerging artists working at the forefront of contemporary art. The de la Cruz Collection Contemporary Art Space in the Miami Design District features an array of modern and contemporary art, but it’s best known for providing art workshops, artist residencies and education in the visual arts. During your shuttle ride from place to place, you’ll pass the trendy boutiques and urban-chic stores that give these areas their unique allure. You’ll then visit the famous Wynwood Walls and the Wynwood Doors. These two adjacent outdoor exhibits feature giant canvases, murals, graffiti and street art created by some of the world’s most influential contemporary artists. After your gallery visits, you’ll be treated to a gourmet 3-course meal at your choice of celebrity restaurant.